History is always inspiring fashion and the Victorian era is my all time favourite.So with this as inspiration I designed and made this necklace. I have used a vintage optometrist lens and added it to a 32"(full length not shown in the picture) sterling silver chain to emulate a Victorian monocle. 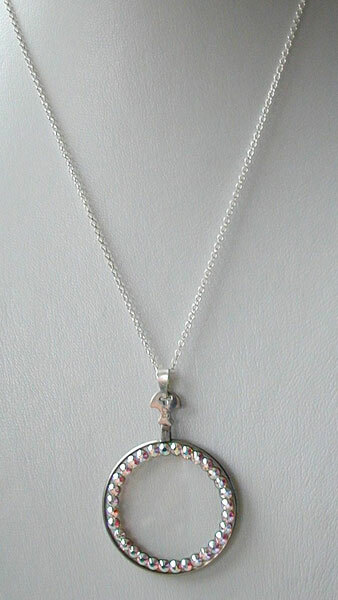 This pendant has a 1.5" metal frame surrounding a glass lens.The glass have been decorated around the edge, on both sides for added glamour, with Swarovski AB rhinestones which shimmer with so many colours. 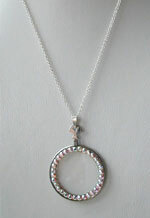 An ideal piece for this seasons look and will add sophistication to any outfit.